Since 1999, we are Boise’s most experienced NAET Provider in the Treasure Valley. Are Allergies the cause of your illness? 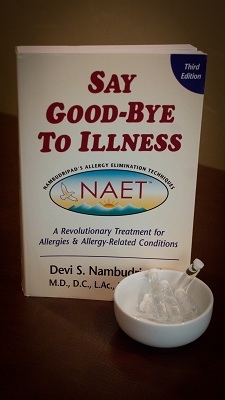 Nambudripad’s Allergy Elimination Technique (NAET®), is a non-invasive, drug free, natural solution to eliminate allergies of all types and intensities. From a Western medical perspective, an allergy is an overreaction by the immune system. An allergy is defined (by NAET®) in terms of what a substance does to the energy flow in the body. When contact is made with an allergen, it causes disruptions in the energy pathways called meridians. NAET® uses a blend of energy balancing, testing and treatment procedures from acupuncture, allopathic, nutritional, and kinesiology disciplines of medicine. NAET® can successfully eliminate adverse reactions to egg, milk, peanuts, mushrooms, shellfish, latex, grass, ragweed, flowers, perfume, animal dander, animal hair, chemicals, and other environmental agents. Nambudripad believes that the central nervous system and associated sensory systems have the ability to detect the “electromagnetic signatures” of all molecules, with the central nervous system either: attracting, ignoring, or rejecting a particular substance. Rejection is said to manifest itself as an energy disturbance or blockage in the flow of qi along meridians. NAET® proposes that these allergies can be eliminated by addressing the energy blockages through the use of acupuncture or acupressure. NAET practitioners use a form of applied kinesiology to diagnose allergies by comparing the strength of a muscle in the presence and absence of a suspected allergen. Practitioners will then aim to remove energy blockages by having the patient hold a vial containing the allergen whilst acupressure or acupuncture techniques are employed. After treatment, the patient rests 20 minutes while continuing to hold the vial containing the allergen, then instructed to avoid the allergic substance for the following 25 hours. Patients are advised to return to retesting with NAET between 25 hours and 7 days after the treatment.